In the past decade, a dramatic shift has taken place with respect to how Americans engage in the recreational enjoyment of wildlife. State agencies have maintained that their mission statement requires them to provide for the recreational enjoyment of wildlife – and that mandates them to provide hunting opportunities. Traditionally, "recreational enjoyment of wildlife" has meant hunting, and that was the interpretation given it under law. The economic and moral shift that has occurred has given new meaning to the term "recreational enjoyment of wildlife." It requires a new interpretation of such legal mandates and a re-examination of the commercial opportunities that are provided by the recreational enjoyment of wildlife. The shift has seen wildlife watching as a recreational activity far outstrip hunting in the number of participants, population percentages of participants, and in the amount of money spent on the activity. We would expect the government agencies that are charged with providing opportunities for the recreational enjoyment of wildlife to develop programs to accommodate this numerically larger population whose purchases far exceed those of hunters. But, perhaps even more importantly, we would expect alert businesses to shift their attention from accommodating hunters to capturing this exciting new market of wildlife watching – especially since the two markets often make irreconcilable demands on resources. It won’t be long before the wildlife watching programs will come into conflict with the more poorly funded hunter programs that cater to only a fraction of the population. Both programs in most places can not be accommodated simultaneously. Wildlife watching trends are significant nationwide but they are especially noteworthy in the States of New York, Florida and California. All statistics cited below are all from the "2001 National Survey of Fishing, Hunting and Wildlife-Associated Recreation." This survey is published every 5 years by the Fish and Wildlife Service of U.S. Department of the Interior and the U.S. Department of Commerce. Certainly the nationwide expenditure of $38.4 billion for wildlife-watching related activity makes wildlife watching a major industry. If wildlife-watching were a business it would be in the same league in terms of annual sales as Pfizer ($40.36 billion), Time-Warner (38.08 billion), or Prudential Insurance ($38.22 billion). Wildlife watching is a major economic player which is currently under-reported and underrated. It is a veritable business boom waiting to be discovered. Inn keepers and resort owners should take note that a considerable portion of the expenditures are for food and lodging! Nationwide hunters annually spend $2.45 billion on food (a lot of beer) and lodging in connection with hunting related activities; Wildlife watchers, however, spend $4.82 billion a year on food (with more diverse drinks) and lodging in connection wildlife watching related activities. Consider that wildlife watching is not yet institutionalized! Each year in New York State hunters annually spend $82.4 million on food and lodging in connection with hunting related activities. Yet, wildlife-watchers annually spend $124.4 million on food and lodging in connection with wildlife-watching related activities in New York State. The report shows that wildlife watchers are better educated, more affluent and travel with family members more than hunters. On average, hunters have no education beyond high-school; the median wildlife-watcher has 1 to 3 years of college. Seven percent of people with a family income of over $100,000 per year hunt, but 40% of those with a family income exceeding $100,000 engaged in wildlife watching. While only 9% of hunters are female – about 50% of wildlife watchers are female (54% of state-residents and 48% of out of state wildlife watchers are female). It’s important to realize that this has happened with little or no pro-active effort on the part of the inn-keepers and resort owners to attract wildlife watchers. On the contrary, by permitting and even encouraging hunters to come into areas when wildlife watching could be at its peak -- in the fall and during bird-migrations -- wildlife watchers are being sent a message to stay away. We propose a pro-active campaign for communities and businesses that have a natural wildlife resource to promote wildlife watching opportunities in their areas. Wildlife watchers are not a destructive force, they pose no risk to others or surrounding houses. They prefer to be as unobtrusive as possible. If resorts set up platforms, tree stands, and blinds, it would bring many eco-tourists to remote areas such as the Catskills region of New York State where the local economy has been devastated since the 1960s. Certainly, promoting wildlife watching as a tourist attraction is sociologically as well as economically preferable to introducing casinos. The conversion of some of the old resorts to accommodate wildlife watchers can be achieved for a relatively modest investment. It would also benefit the resort to invest in the construction of living platforms over water, for example chickees http://www.nps.gov/ever/visit/sitetype.htm , and boardwalks over wetland areas, as is currently done in the Everglades in Flamingo, Florida. This should all be done in consultation with experts. Wildlife watching will provide lucrative financial returns. This is a major industrial development waiting to happen. It is a win-win-win situation for the resort-operators, the wildlife watchers – and the wildlife. Please contact us at wildwatch@verizon.net to become involved in this multi-faceted thrust to a brighter future for all. Hunter websites, like Cabelas, offer products that can be used by wildlife watchers to enhance their experience. Should wildlife management agencies begin to focus on watching, you can imagine the increase in business for products such as the one to the left that sells for only $13. The catalog describes it this way: "The comfortable behind-the-ear Woodland Whisper has five settings for up to 98db amplification with a decibel-limiting feature that won't amplify loud noises, so you can hear the faintest sounds in the woods." Rita Sarnacola of CROW (Citizens Respectful of Wildlife) in Auburn, NY has been working on ways to wake up the town to the economic potential of wildlife watching. A bar has been having "crow shoots." Rita and Wildlife Watch would like to see Auburn, NY become the crow capital of the country. Wildlife Watch volunteers will soon be doing a presentation in Auburn to discuss the potential of wildlife watching and setting up for viewing these sociable, intelligent and playful birds. We will emphasize the economic potential that crow watching will have on Auburn. 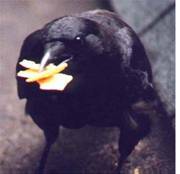 www.crows.net/help.html - Have some cornchips!